“We humans are in trouble… Never before in human history have we had such conveniences and such knowledge, yet never before have our lives been so stressed and unhealthy”. It’s true. Because we constantly live in a state of paradox. Where we want to be busy, but at the same time not. We want to be prosperous and financially comfortable, yet we don’t want to work hard to accomplish this. We want to realise our dreams and ambitions, but with the least amount of effort possible. This amazing TedX talk discusses exactly that. And the way I fell across it reveals precisely how inspiration can come when you least look for it. We spend our working days doing exactly that – working – sometimes even overworking ourselves, racing against time, trying to fit everything in those 24 hours that sometimes never feel enough, forcing ourselves to rush to be prompt for our appointments, meetings, errands and classes. Often even forgetting to eat or drink, let alone breathe. We have become so accustomed to this lifestyle that we have truly forgotten the very basics of it. Of what it is like to be human, and just… live. Remember how when we were kids – without all the digital technology – we used to laugh endlessly for no reason, being carefree, happy, and most of all stressfree? Learning was a joy. As was socializing and relaxing. Naptime was a chore, but now… now we long for an extra hour (or half) of sleep whenever possible. The aforementioned talk refers to those amazing animals we all at some point or other wished we were: dolphins. They are cheerful, playful, sociable and intelligent. Who wouldn’t want to be like them? But above all, they teach us three fundamental things that in our hectic lives we’ve lost touch of: how to play – with no rules, no limitations, and find new passion through creativity; how to socialize with others – make real connections and bonds and through that find new purpose; and how to find “downtime” – to relax and rest, to slow down and pay attention, to find this much needed balance that will bring about life satisfaction. “We are so on-the-go that stress has become the number one health epidemic of the 21st century, wreaking havoc in our bodies and minds”. It is a fact that even large companies nowadays introduce mindfulness exercises as a means of demonstrating that “breaks are the moments of breakthrough”; it is where we find inspiration and innovation. And it is how we can adapt to our constantly evolving world and thrive. We need that moment of rest – even if it does mean that you have to fight the “withdrawal symptoms” of constantly being busy, feeling more tired when you’re doing nothing. You need that time precisely to discover all the new things you can do, which you never thought you had the time or energy for. You need to stop, before you can start again, stronger and better. A wise old woman once told me that you should look to find someone who matches your level. It may sound simple, but as you mature and widen the perspectives through which you view the world, you realise that this is more difficult than it seems. Every day we meet various people from different fields of social life. It depends on what we do and the circles within which we interact, but, regardless, if you look around you, you will see that we are surrounded by people from varying age groups, educational levels, social backgrounds, religious convictions, sexual orientations, financial prosperity, nutritional preferences, etc. What makes us get along better with some over others is, however, common habits and perceptions. Having similar viewpoints is something that would enable you to develop closer ties with certain people. It’s those who you choose to be your friends, your confidants, your partners. But, even with them, some times you need to compromise to resolve potential arguments in case your beliefs collide, and in order to maintain a harmonious relationship. It is said that as you grow older you become more selective and ultimately more demanding with those you have next to you. You also tend to become more experienced, which in most case (should) mean that you are more knowledgeable of life itself. Hence, the reason to seek out someone of your level. Because you need someone on your side with whom you can discuss politics and current affairs, but also sports, technology, fashion, and celebrity gossip. You want to have the option of talking about everything and anything at any given time. It is the concept of having a broad education and being aware of what is going on in the world we live in. That is why you need someone who also shares this outlook. You yearn for someone who can comprehend that when you say you haven’t slept because you were up all night covering a major ground-breaking news development, that means that you literally did not get any sleep and that is nowhere near the same as staying up at a party (yet getting at least 2-3 hours sleep in the early morning hours). Someone who can see that when you’re on the verge of exhaustion, you – just like everyone – have your own way of reacting to it, wanting to be alone in tranquility and avoiding chatter. Someone who can actually understand that complex nature of what it is you do for a living and respect the difficulty it entails, despite the flexibility of the job. Someone, who will understand all of the above and try to assist you, even when you don’t ask for help. We all want someone in our lives who we’ll call a friend, but will really be family. A home away from home when necessary. The person who’ll freely give out hugs or offer alcohol whenever needed. And the one who will know which occasion calls for which remedy accordingly. But what we need most of all, is people surrounding us with whom you don’t need to lower your level to fit in. People with whom you’ll challenge each other to become better, smarter and more informed. That is how the world would change for the better. By pushing each other forward. Not the opposite. Joy was a girl who personified the meaning of her name. She was a wave of optimism walking into the room. Her eyes sparkled when she smiled and her good mood easily transmitted to those around her. She loved to please people, to entertain and have a good time. But most of all she loved the preparation for it: the elegant clothes, the glistening jewels, the chic hair-dos. They all belonged to the process of feeling good and showing it. Yet, these were all things that required money. Joy didn’t have a problem with that, so she didn’t really take into account how much she was actually spending each month on these “little luxuries”. She had the ability to do so. It was one day at the end of winter that was resisting the imminent arrival of Spring. The company manager called all the employees into the glass conference room and announced solemnly that the end had come. The company could no longer cope financially in the increasingly competitive market. So it was letting everyone go and was dissolving overnight. People didn’t immediately realise all the consequences this involved. It was not just the fact that they would become another statistic in the rising unemployment rates. It was not that they would have to face an uncertain period of idleness. It was the fact that without an income, they would all have to start counting their pennies. Literally. When that thought struck Joy’s mind, that is when the clouds set in. Because, now, when her friends invited her out and expected her to show up glowing and glittering under the stars, sipping cocktails on roof gardens, and dancing in extravagantly decorated ballrooms, Joy had to maintain appearances. She had to continue living up to her name, despite the fact that her sparkle had faded. She was no longer carefree, because she witnessed day by day her bank account shrinking. And until she found another source of income, she had to restrict her outings. She was confused, though. She couldn’t stay in and do nothing, see no-one, out of financial fears. How did everyone else do it? All those others who earned so much less than she did? One night, when the full moon lit dimly over the city’s so-called “high society” or wannabe-elites, Joy stood in a corner of the room and paused. She looked around, observing the crowd that had become part of her usual outings. Their clothes, their shoes, their hairstyles, their hand gestures, their body postures, the intonation of their voices, their fake smiles. She wondered when she had allowed herself to become so superficial, thinking that because of the money she so carelessly threw around, she would “fit-in” and become likeable. She had become so drawn-in to this lifestyle that she had forgotten the true meaning of her own name. She ran out, saying goodbye to no-one. She rushed home and called him. Him, who was always there for her through everything, but whom she so often failed to acknowledge. When the first beam of morning light hit his face, Oliver sprung out of bed. He was excited. Today was his interview. He had been searching for a job for months now and could not even remember how many CVs he had sent out, let alone to whom. Just a few days ago, he had finally received a positive response after so many courteously phrased rejections. So, he put on his smart-yet-not-too-casual clothes and set off for what he believed was a great opportunity. If he landed this job, it would be a stepping stone to advance into something greater. At least that is how he perceived it in his mind, given all he had read about the said company. Even if it did not work out, however, he still thought it would be a good chance to learn from it and become better, even if it was just at the interview part. But Oliver could never have imagined what followed. The minute he walked into the office, the secretary did not even raise her eyes to meet his. She looked at him almost demeaningly and simply grunted when she was to accompany him in to the office of the company’s CEOs. In turn, these two men stared at him, as if trying to sting his entire body with invisible beams of fire launched from their eyes. Oliver already felt the sweat beginning to form. He sat down timidly without saying a word. Then the CEOs did something that seemed entirely out of their nature; it was too obvious to miss: they smiled. It is easy to detect a fake smile, especially when it is so forced upon a person you can see them cringe. Oliver kept a blank expression. He thought it would be best. He was asked to briefly introduce himself, which he did. And then he had to listen for 40 minutes, while both CEOs outlined the contractual obligations he would be committed to once he entered the specific company. Not once was he asked why he wanted to work there. He had prepared an answer for that, as it was a common interview question. Nor was he ever told what the company could offer him. Instead, he was bombarded with a list of obligations he would consent to, not least being punctual and succumbing to anything his superiors would ask him to do. Worst of all, he was to provide a monthly subscription to the company for the space he occupied there. In plain: he would pay them to work for them. Asked if he was clear with the terms, Oliver nodded vacantly. He was then handed an 18-page contract, titled “agreement”, which he was to sign and return by the next morning. What he did not comprehend, was that he was never expected to read it. Because that would be considered “paranoid”. That was what the CEOs described it as in the reply email they sent him when he kindly declined their offer. Because to them, the simple fact that he attended their meeting was a verbal commitment that he was on board with everything they threw his way. Oliver knew differently, however. This is not what companies were expected to do. And contracts existed for a reason. To be read and understood before being signed. If these people were so afraid of revealing the exact terms outlined in a so-called agreement, then something was wrong with it. And if they felt so insanely insecure about everything they said and did, that they desperately needed to conceal it all, then there was definitely something that was not right. Oliver realized that in time to get away. And he was glad he did. Because sometimes, the greatest lessons you learn are from the places you least expect it. They are concealed behind facades that tempt you otherwise. On the nights he slept over at his grandmother’s, Seth was always tucked into bed with the goodnight wish that “the brightest things would come to him when he least expected them.” His grandmother explained that that is when he would appreciate them the most. Seth never did understand what she meant. Until he grew up and turned 34. Seth had become close friends with Murphy. This guy had a global law named after him, which was the embodiment of the phrase “when it rains, it pours”. Seth knew it well. Despite wanting to believe what his grandmother had insisted on instilling in him – that all the proper things come and find you at the right time – he refused to believe that nothing good ever stayed with him. At 27, he was still living with his parents, scraping by, working as a waiter at a nearby café because he could not find any paying work in his university-degree sector of engineering. At 29, he broke up with his long-term girlfriend because she could no longer take his uncertainty, his pessimism and his lack of ambition. She was the type who believed there was nothing wrong with trying to reach further than you could see. Seth was the type who needed glasses to see the end of his fingertips. At 32, a major crisis struck. Seth was going through what most people experience at some point in their lives – reminiscing of how everything used to be simpler when we were younger, of how nothing turned out the way you expected, and of how the future looks so bleak, you don’t see anything worth fighting for anymore. But that is when things began to change. When he thought that everything would simply continue downhill. An executive officer of a multinational corporation walked into the aforementioned café one day. Seth was the one to serve him, but having seen him numerous times there, he suggested exactly what the businessman wanted to order. Frequent customers usually have fixed preferences. The businessman was having a rough day, and was encouraged by the smile on Seth’s face and the kindness with which he was approached. The small talk while the coffee was being prepared turned into an invite to an interview, which two days later became a work offer. Two years later, it was Seth who was in charge of his own department, drinking coffee with the businessman, instead of serving him. And that was when he remembered his grandmother’s words. Because he had settled the career issue, but what about the relationships phase? He had met all sorts of women during the years: the crazy ones who checked your phone when you went to the bathroom; the really crazy ones who also checked your pockets and bags; the insane ones who would freak out if they saw you with another woman; the ones who didn’t really care because they were already cheating on you; and, of course, the right ones at the wrong time, who were already in other relationships. He would return home and feel alone. Even Heather, his Siamese cat had befriended the Tomcat from next door. His mind ran back to Esther. She was for him “the one that got away”. He believed everyone had one such person. But come night, he would remember a story his grandmother used to tell him, that when souls were created, they split in half when they fell to Earth, and ever since people spend their entire lives trying to find their other half. Seth was overcome by grief and longing for Esther, but could not sum up the courage to call her. So many years had passed, she would certainly have moved on. There are times when in life, nothing happens, and then when you finally find the door to open, events come pouring onto you like an avalanche. That is what happened with Seth. When one night the phone rang, and the answer to his curious “hello?” was a soft trembling voice he knew too well, stating “it’s me”. It’s a great feeling being passionate. To have this incessant energy to do more, to want more, to want better. In everything. For every part of your life. The problem comes when you feel the compelling need to make a living out of this passion. Everyone will try to convince you that doing what you love is all that matters. So you try to do that. But then you will soon come to realise that what truly matters is being able to live off what you do. So you will have to compromise. To reach for things that you didn’t think of previously, but at which you are good at no matter if they simply please you, rather than enthuse you. That is how you learn that elaborating on your passion will sometimes be restricted to something you do for you, to maintain that pure emotion of loving what it is that you do, that you are talented at, and that you enjoy. It would be great if we could all do what we love most and get paid for it so much that we needn’t do anything else. But unfortunately, you will soon come to realise that that is not how the world works. 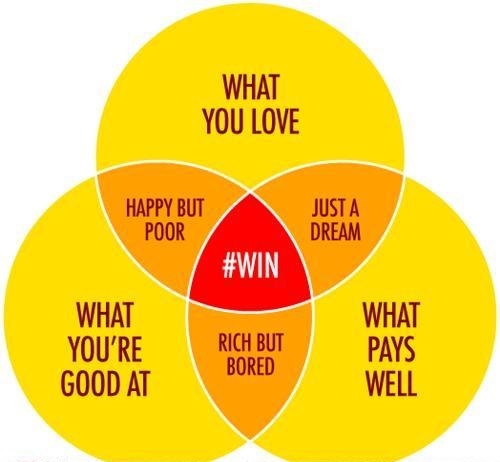 Many have argued for or against “finding what you love and making this your work”, but there is a distinct difference between doing something for the pleasure of it, and doing something because you must in order to get compensated for it. The notion alone clarifies the distinction. Some have even argued that “the goal shouldn’t be to find your passion—as if it has been there, undiscovered, from the beginning—but to create one”. There is an underlying truth in that, because the reality is, whatever it is you do, you should like it even just a little bit. Because otherwise, it is no longer work, but a chore. And there is a whole other definition for that too. So in essence, you shouldn’t give up on your passion, just don’t expect that it will be easy or entirely satisfying to make a living out of it. Because once money is involved, you always know that the commercialization of this world means that someone else also profits of you. Sometimes without them even doing anything. And then that becomes exploitation. Especially if you’re so adept on exploring the opportunities offered through your passion that you’re willing to do it for free, in the hope that once out there, someone will notice you and come calling. You just need to be careful and aware that certain distinctions in life are made to be kept. Not everything is as easy or as blissful as it seems in theory. He spent his last £30 on a plate of oysters and a glass of champagne. He didn’t mind that he would now be broke. It was worth it. 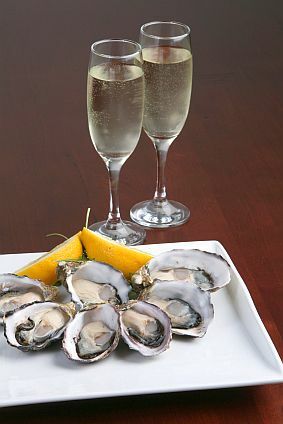 The oysters were exquisite and the champagne was bubbly and fruity. Not that he had anything to compare them to. He had just arrived in the country he now called home. He was one of the thousands who believed fleeing from the only home you know was the single chance you had for a tomorrow. The future was all he would think about when he stepped his trembling body into that rocking boat. He didn’t know where he was heading to, but looking back at the fire burning his village, he knew forward was the only way he could go. Life is full of surprises, they say. For when he reached the shore, the informal “welcome committee” consisted of one of his cousins who had arrived a couple of years ago. Following a reunion that alternated between tears and jumping jacks of joy, he soon found a new home, even if just a temporary one. However, finding work was not easy. There were so many unskilled workers asking for jobs, the competition was so great, that it all came down to who would accept less. His first job interview failed because he couldn’t understand what the employer was saying. His second because he couldn’t respond fast enough. His third because he did not give adequate replies. His fourth because his reply to the question “where do you see yourself in five years” was “alive”. His fifth because he was too old for the job. His sixth because he had no experience for it. His seventh because they had already hired the person before him. He needed money somehow. He needed food. His stomach was already grumbling and he could not continue to live off his cousin forever. It was not proper. All he had left was £30, which he insisted that he would soon pay back no matter how much his cousin refused. His meals had consisted of bread, cheese and apples, as little as he could eat a day in order to save the cash. But he was now drained. He needed a proper meal. Autumn had settled in and the brown crispy leaves crackled under his feet as he tottered pensively along the central avenue. The rain began to fall, slowly at first, caressing his stress-sweated face, and then rapidly like a torrent attempting to cleanse out the pain of his soul all at once. He stood still in the street, as people all around him rushed for shelter. He had lived through worse. A little rain would do no harm. On the contrary, it was welcome. The avenues began to fill with water like empty tanks fill up. The hundreds of fallen leaves had blocked the gutters, tapping all the water into the streets. There was no outlet for the water that was now raging from the dark sky. He looked down at his feet, which were by now in a puddle of rainwater mixed with black-trampled-on-leaves. Right in front of him was a blocked gutter. If he could just remove the dirt, he would manage to alleviate some of the gushing water and perhaps restore calm. He took a fallen branch from a nearby tree and began to clear out the gutter. He then proceeded to the next one further down, and the next one. By the time he reached the top of the avenue where all the fancy and elitist restaurants where, the rain had diminished to a drizzle. Exhausted as he was, he stopped to check the result of his feat. The roads had mostly cleared from the rain, everyone seemed less annoyed, and it was quieter now. The smell of wet leaves reminded him of how hungry he was. He stepped into the restaurant in front of him and ordered a royal lunch. He didn’t care people looked at him disapprovingly. In his one month there, he had done more for them than they had even thought of doing for him. It was time to live in the moment. When he saw a municipal worker approaching him with an applauding smile on his face, that was when he thought that just maybe, that moment would give something back. The story was an entry in the Guardian Masterclasses blog competition.